Question: How can I make the Quick Access bar appear below the ribbon? 2) In the drop down menu, click ‘Show below the Ribbon’. 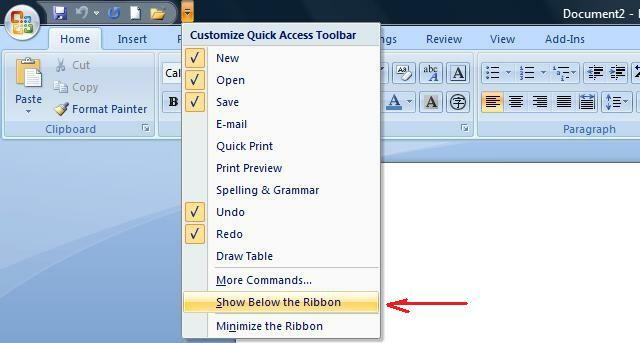 To make the Quick Access bar appear on top of the Ribbon again, perform step no.1 and click ‘Show above the ribbon’. Question: How can I minimize the ribbon in Microsoft Word 2007? / I hid the ribbon but now I want it back. How do I do this? 2) In the drop down menu, click ‘Minimize the Ribbon’. You can make the ribbon appear again, perform step no.1 and then unselect ‘Minimize the Ribbon’ by clicking on it in the drop down menu. The ribbon should appear. 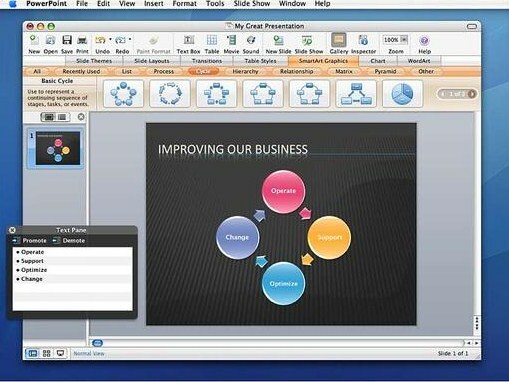 Question: Is there going to be the Ribbon (which is featured in Office 2007 for Windows) going to be present in Office 2008 for the Macintosh? Answer: No, there will be no Ribbon for Office 2008 for the Macintosh. This is because the user interface of Office 2008 have to look alike to other Mac applications. This means that, instead of the ribbon, there will be the old menus such as ‘File’ and ‘Edit’, etc. The Ribbon is absolutely excellent to use and work with, especially for less computer literate users. With the Ribbon, you can now visually see the features and functions that you can use. A lot of basic users will probably say ‘Wow, Microsoft must have added a lot of new features to Word 2007’. But actually, there aren’t many new features at all. Most of them were already there is Word 2003. But the problem was that many people do not realize that the features were even there. And that’s exactly what the Ribbon is for; to show users the features available. 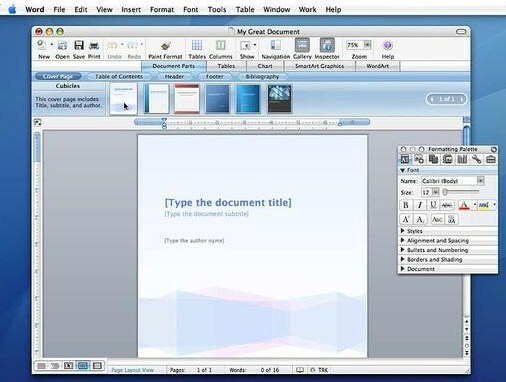 Personally, I think Microsoft has done a very good job with the Ribbon.The Ribbon is not only present in Word 2007 but also across many other Office 2007 applications such as PowerPoint. Question: Should I upgrade to Microsoft Office 2007? Is it a worthy upgrade? What should I know before I upgrade and is my computer capable to run it? Answer: There wasn’t much difference between Microsoft Office 2000 and 2003/XP. The user interface was very similar and only slight improvements in functionality. However, Office 2007 is a big change. In fact I think it is the only Office suite that is worthy to upgrade. Personally, yes, I do think you should upgrade. But please make sure that you qualify for the system requirements. I personally recommend 1GB of RAM and a minimum of 10-15GB of space hard drive space. However, if you are a happy with what you have and don’t need anything more, you don’t have to upgrade. But I do recommend you to take Office 2007 for a test drive. This test drive is not a trail and you do not have to download anything. The free test drive is an online version of Office 2007 in which you can learn and test out the features and what you can do. This is the best way to determine whether you should upgrade or not. Click HERE to take the test drive. Can I run Office 2007 on Windows XP? Question: Can I run Office 2007 on Windows XP? Question: How do I change or format the line spacing in a Word document? 2) Click on ‘Paragraph‘ in the drop-down menu. 3) Under the ‘Indents and Spacing’ tab, go to the ‘Spacing Menu’ and in the ‘Line Spacing‘ drop-down menu click on the spacing interval you would like.bar.